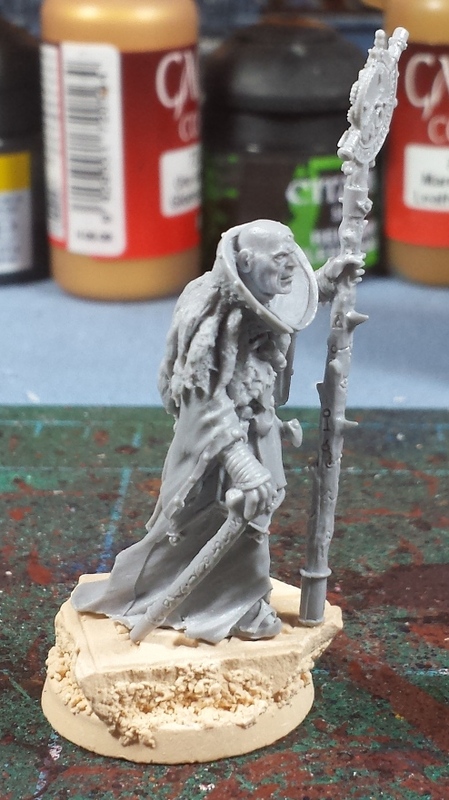 A friend of mine was able to attend the recent Heresy Weekender in Nottingham and was gracious enough to pick up one of the event-only Navigators and mail it (along with some other event goodies) across the pond to me. Woo-hoo! I've always loved the lore behind the Navigator Houses, it's a fascinating sub-culture in the 40k universe - they are inextricably woven into mankind's history and exploration of the galaxy, and they have incredible power and influence that they can bring to bear. 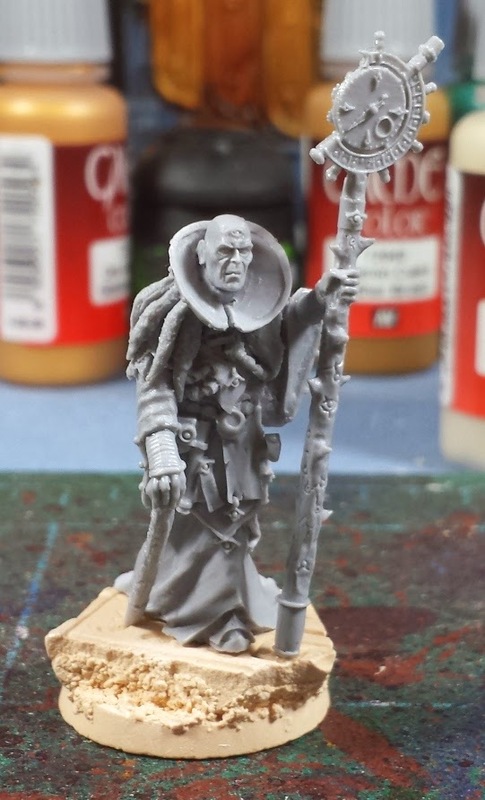 This fellow will be joining my Thousand Sons army as Expeditionary Navigator Fortunato Locarno - whom I envision as being the great great (great great etc) grandfather of Lustram Locarno, the navigator called out in the RT-era rulebook. 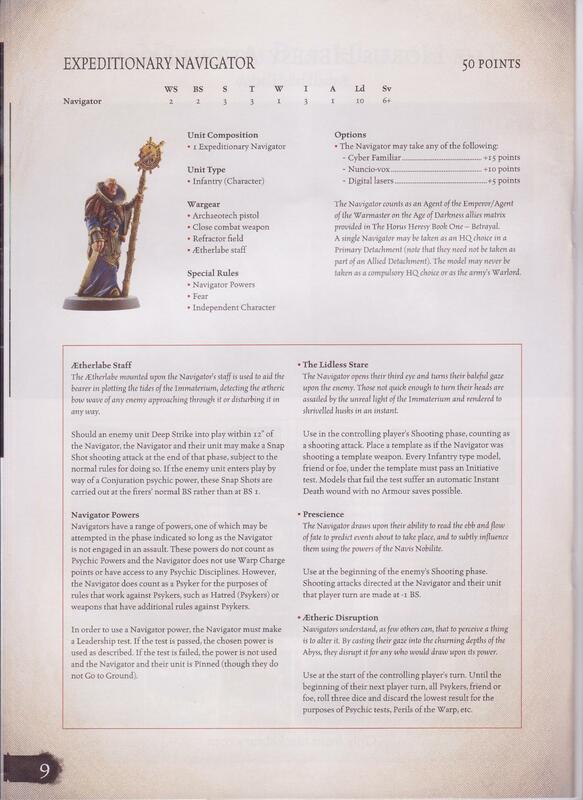 He'd also sent along a couple of the event catalog pamphlets which to my surprise actually included rules for the Navigator! Granted, they were written for use with 6th ed, so some of the rules don't really apply anymore - still, he'll be a fun addition to the army! That is a nice looking mini! look forward to seeing it painted up. Are the rules easy enough to adapt to 7th? 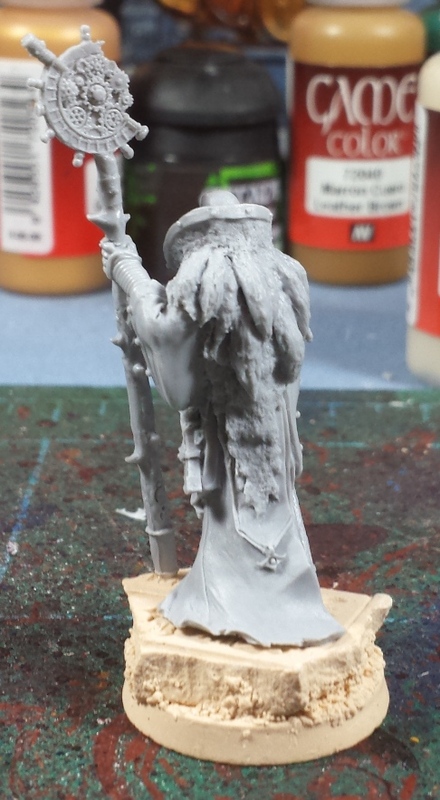 I dig that Navigator, and I'm really excited to see it painted. That's very cool that you have one of these. Hopefully I won't spoil him for you when I tell you a friend of mine recently asked "What's up with his collar of weasels?" @LuckGod: Aye, I'm itching to get some paint on him! One of the skills is essentially irrelevant in 7th, but the other two abilities are rather useful! @Pawn Cocktail: Indeed! I like that it's so unusual. Definitely seems like a polarizing model, people seem to love it or hate it! @Davetaylor: Hah! Aye, it's got a touch of the "Blackadder's cat-based robes of state" to it. I actually sort of like the absurdity of it! That model is sweet! My buddy's compiling a Genestealer Cult by allying bids with chaos. This model would make a great Magnus. oh that is very nice and will be a fun departure from all the power armour! O wow.... I am so envious of you mate. Now I see these figs going for $40+ on Ebay.... I'll have to search the Chinese knockoffs sites. I was going to say it looked like 'finest cat' too. That Lidless Gaze is pretty brutal, nice way to take out a Tervigon! @Zab: You said it, I'm getting pretty tired of power armor - this guy will be a welcome change of pace! @Dave Weston: Hah! I'm looking forward to trying it out! Heresy Era Thousand Sons - Characters ahoy!